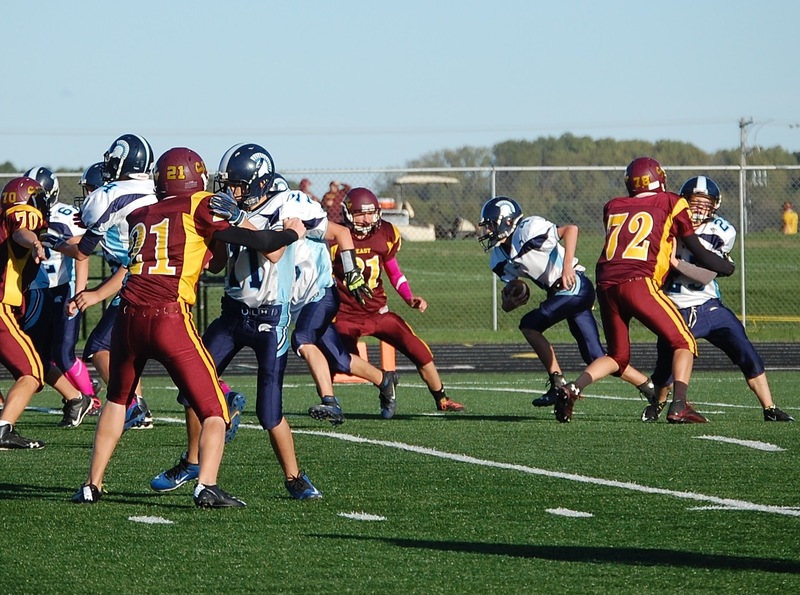 The freshman team completed an undefeated season in late October, finishing with a 7-0 record. The team averaged 48 points per game, and allowed an average of eight points per game. This is the first time since 1989 that any West Bend football team has had a perfect record. In 1986, the East ninth graders took home one of West Bend’s only conference titles. As seniors, that same team made history with a perfect season. Now, 26 years later, a very talented freshman team has West Bend wondering whether history will repeat itself, and whether East football will have another varsity championship three years from now. However, achieving that will be no easy feat. A good team requires skilled players and hard work, but to receive a perfect record on the varsity level, a special kind of team is needed with the ability to edge out all other teams in every possible situation. Does East football have what it takes? Ralph Schlass, the starting quarterback of the last undefeated East football team, was asked about why the 1989 team had so much success. “Having team leaders, having a common goal, and putting in off-season time,” said Schlass, now an assistant principal at the high schools. When Tom Simpson and Russ Schlosser, coaches of the 2015 freshman team, were asked the same question, they gave similar answers. “It’s because the kids have grown into the system of team football, everyone does their jobs and understands why they do them. Eleven players executing on each side of the ball and realizing what they do can make or break the play of the team,” Schlosser said. “Working in the offseason, being confident, and playing unselfish TEAM football,” Simpson said when asked about what’s needed for success. Perhaps it’s a promising sign that the current coaches echo Schlass’ views about players working hard and performing unselfishly. Yet the similarities between the 1989 and 2015 teams don’t stop there. Members of both teams, past and present, agree that smart and strategic coaching plays a crucial aspect as well. “Our  coaches paid a lot of attention to detail, and they played to our strengths, they knew what we could do well and what we couldn’t,” Schlass said. If Schlass is correct that meticulous and strategic coaching was one of the most important aspects in winning the 1989 title, the current freshman team feels they have that going for them, too, significantly improving their chances at success in future seasons. “I felt that the coaches [this year] were able to make plays that better suited our individual abilities and team abilities,” said Jacob Schwechel, the team’s starting tight end, starting safety, and backup quarterback. “The coaches picked plays based on our talent,” said Jack Odness, starting defensive end and backup tight end. Another aspect that both Schlass and the current coaches agree on is how important it is to have adept players on the field who have the ability to adapt and react to the other team. “Strong communication between the players and coaches made making adjustments in the games keys to success. Players were encouraged and expected to help the team improve by telling the coaches what they see,” Schlosser said. “You have to have smart players. One of the things we prided ourselves on [in 1989] is we would call a lot of audibles,” Schlass said. A team can only prepare so much for a game. Both the old and the new teams agree that, to have an unstoppable team, the squad must know how to adjust on the fly in the midst of a fast-paced game. Though there may be signs pointing to an extremely bright future for East, there are numerous other variables that are important to a great football team that could go either way for this team. Currently East has many extremely talented players, but even the loss of a few players for any reason whatsoever could have a negative impact on the team’s chances at achieving the varsity conference title. “We have a lot of talent. Our team is pretty phenomenal and should keep on getting better over the years, but it depends on if we are able to stick together,” Odness said. “We need every player on this team to do their job for our success,” Simpson said. 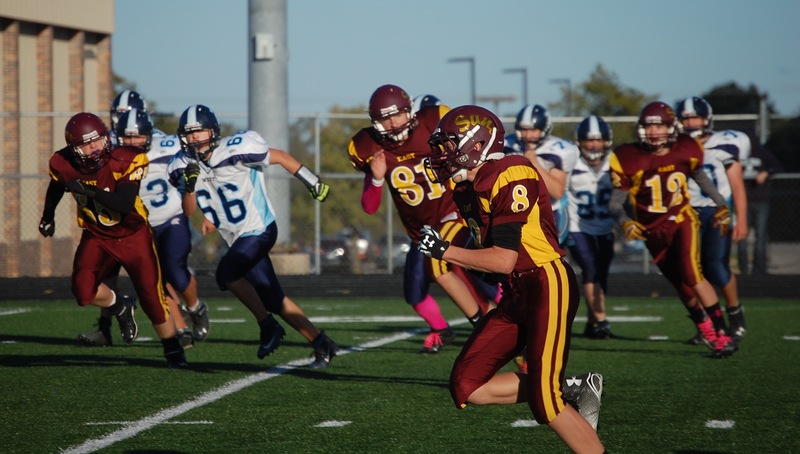 Even so, the East freshman football team has confidence that over the years they will continue to improve, and that they have a strong shot at bringing back the conference title.